It has been said that where there is no vision, the people perish. However, for 64 year old Michael G. Jackson, the founder of The Crash Prevention Network – a non-profit organization dedicated to saving lives on the highways and providing support for the surviving loved ones of fatal crashes – this is not entirely true. Mike Jackson is totally blind. Mike was born with retinitis pigmentosa, a genetic eye condition that inhibits one’s sight early in life and then ultimately leads to incurable blindness. Growing up, he witnessed his father’s own struggle with the disease and experienced firsthand the hardships it brought on his large family. This plagued Mike with fear and he knew that an enormous battle would have to be fought if he were to have even a normal life. But encouragement was hard to find. One of his elementary school teachers sent a note home to his parents once saying, “Don’t expect much from Michael. He just can’t keep up with the other children.” Seeing the note by accident, Mike said it felt like “someone had driven a dagger through my heart.” But instead of having what would have been a very understandable pity party, Mike found himself angry and determined to turn a heart breaking experience into something motivational; however, as his sight grew increasingly worse, his boyhood aspirations faded as well. Mike did get to drive; however, the experience was short lived when, at the age of 19, his poor eyesight rendered him no longer eligible for a license. “It was like being given a death sentence!” Mike says. However, the day proved bittersweet because it was that evening, when he and his best friend were double dating, that Mike went out with Janice for the first time. So his sad day ended on a pleasant note and proved even more memorable as Janice later became Mike’s wife and mother to their daughter. As a young husband and father, it was Mike’s struggles that taught him that determination and persistence could produce results. But as his ability to see worsened, he found himself wondering how he was going to support his family. He even considered utilizing a .38 pistol on himself so they could benefit financially, but he soon realized that fear was leaving his judgment more clouded than his sight. So Mike surrounded himself with proactive people and built solid friendships that contributed greatly to his life. “For me it was either stay home and accomplish nothing, or be happy,” says Mike, “so I chose to take all the blessings that God offered and pay no attention to the negative side of life.” It had taken years, but Mike had won his personal battle. However, just as his visual world went completely dark, a public battle was just beginning. On January 23rd, 1990, less than two months after Allison’s death, Mike formed the first Mothers Against Drunk Driving chapter in his county with 83 volunteers. In his first year, highway deaths declined from a yearly average of 31 to 13; and in later years that number dropped to 9. 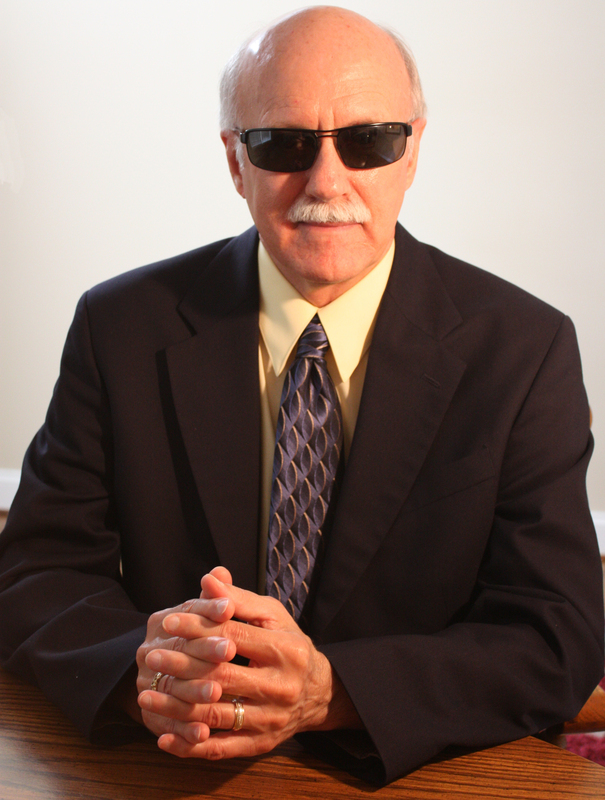 Mike also formed 19 additional chapters, became Vice Chairman for his state’s M.A.D.D. program, and was heavily involved in legislation that helped get the legal drinking age raised to 21, the legal blood alcohol level lowered from .10 to .08, and the seatbelt law passed. However during his tenure, Mike became aware that there were other highway issues besides just drinking and driving. So, after 15 years of dedicated work and multiple awards for his service, Mike left M.A.D.D. and formed the National Angel Protection Program which later became The Crash Prevention Network, an organization focused on highway safety in all capacities. Garnering the support of District Attorneys and Judges, Mike developed a monthly courthouse program called The Right Choice. The highway safety course is attended by people who have committed minor traffic violations and been ordered there by the courts, but the program is more than a court-mandated class. “When our participants show up, they admittedly don’t want to be there,” says Mike. “But by the time a surviving victim of a highway tragedy shares his or her personal story, the whole atmosphere changes. Then, as attendees leave, many of them will take the extra minute to express their gratefulness for what we are doing. And that is when you know you have gotten into somebody’s heart, and that is where change occurs”. 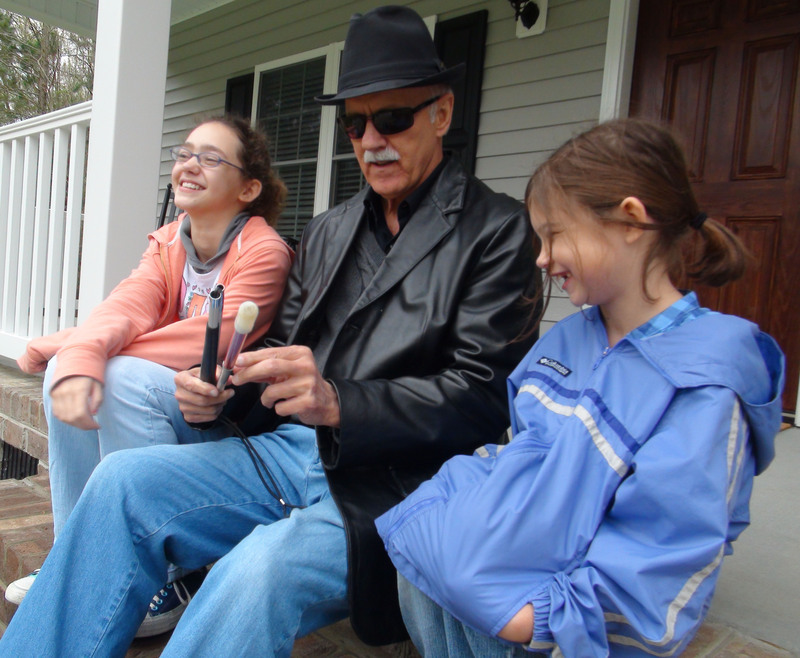 Mike entertains neighborhood kids with his walking cane. Mike Jackson may lack sight, but thankfully does not lack vision. And his message is loud and clear. To become a Member of The Crash Prevention Network, visit www.CPNHope.org. Also, if you would like to know how CPN can sponsor an outreach in your community, please contact us at info@CPNHope.org.